There’s a small vegetarian restaurant hidden on a street filled with fur shops. Was this a form of rebellion? Perhaps an uprising against the fur establishment? Or merely a bright spot on a street devoted to dead animals? 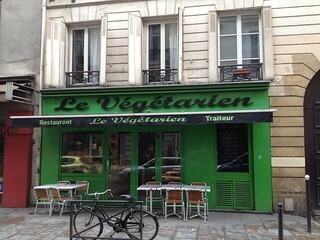 Le Végétarien is a small restaurant geared towards healthy breakfast and lunch. You’ll find an assortment of salads, soups, and vegetables. 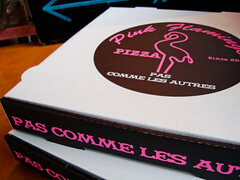 How can you go wrong with a pizza joint that proudly boasts its connection to John Water’s movie Pink Flamingos? Not to mention the old school punk music, ala Ramones, on the speakers. Did I mention the VW bus parked on the street as an alternate dining table? Oh, and they have some great, inventive vegetarian pizzas. Pink Flamingo is all that and more. GreenKiss is a hip site that spotlights how to live a fabulous life while still being ecologically aware. 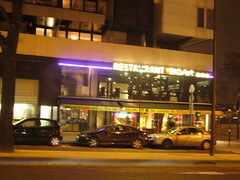 It’s written in French and English and there are sections for food, nightlife, fashion, politics, and more.